It’s a chilly December morning and I’m wandering round the grounds of Warwickshire manor house turned art gallery Compton Verney looking for a group of people who want to discuss how to die in the future. It may seem an unlikely subject for people to want to contemplate let alone discuss on a weekend before Christmas but I’m soon to discover that this day-long workshop is actually sold out. I find the multi-coloured dome structure where the activity is to take place. 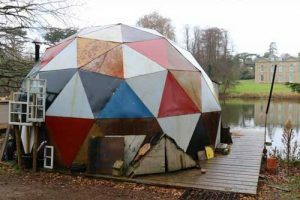 Created out of recycled materials, the dome is a bit like the Tardis when you step inside. There are seats, a log-burning heater, a bed, books, tea and coffee and various other amenities, all created for an art project known as The Clearing. 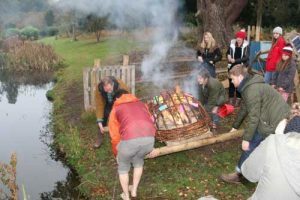 The brainchild of artists Alex Hartley and Tom James, The Clearing has been hosting workshops all year. Aiming to examine the skills we would need to survive in a world affected by climate change, this is the final session in the series – so it’s aptly called How to Die in the Future. Tom is inspired by the science fiction novelist Ursula Le Guin so he begins the session by reading passages from her novel Always Coming Home in which she talks about death and funeral rituals in an imaginary future. Then with the scene set, BrumYODO takes the floor. To begin with, BrumYODO founding member Fran Glover, who is also co-owner of A Natural Undertaking, shares with us the rules and regulations around death, funerals, burials and cremations. It’s a discussion which so many in society shy away from – and yet we quickly discover that give people the opportunity and they are more than happy to question. 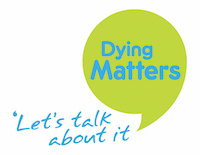 Working at John Taylor Hospice, I contribute to discussions around the choices we can also make regarding death and dying while other group members share their own thoughts and experiences. Questions come quick and fast as the group discovers that so much we believed we ‘had’ to do is actually tradition and that, in reality, we all have so many more options than we thought. Over a shared lunch round a campfire outside the conversation continues with people sharing their recollections of funerals they felt didn’t reflect the lives of the people they’d known or relatives at war because family members hadn’t made their choices known. After lunch we host a Death Cafe with more than 20 people contributing. Initially a bit hesitant in front of such a large group, the discussions soon start flowing covering all kinds of subjects. 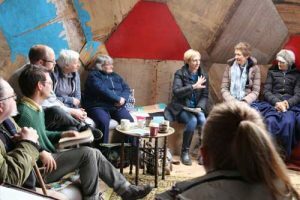 It may seem like a Death Cafe would be gloomy but it’s anything but – while we’re covering some pretty hefty subjects we’re also frequently breaking out in laughter at the random tales being shared. Tom is keen to finish the day with something very hands-on and visual so we’re soon back outdoors making a wooden raft on which we tie messages about our lives or deaths. Set alight and pushed out onto the lake (with a rope attached so we can pull it back! ), it’s a symbol of so many things – the cultural traditions in which fire consumes death, the idea of setting free your thoughts to the elements, the letting go of constraints and returning to nature. Or in fact, whichever symbolic meaning anyone in the group wishes to attach to the ceremony. Unbelievably we’ve been at this for five hours. It may seem like a long time to be discussing death and dying but when it’s so much a part of life, why not? We say our goodbyes and head back into a winter night. Hopefully in that short time BrumYODO has given a group of people who chose to spend a day together discussing how to die in the future something to think about.